Please note: Area 1: From Northern Territory Border to Cape York Peninsula, Gulf of Carpentaria side has not yet been covered. The Northernmost tip of mainland Australia is Cape York Peninsula, Queensland. Sitting just north of Cape York, between Australia and Papua New Guinea, are the Torres Strait Islands which consist of 274 small islands. 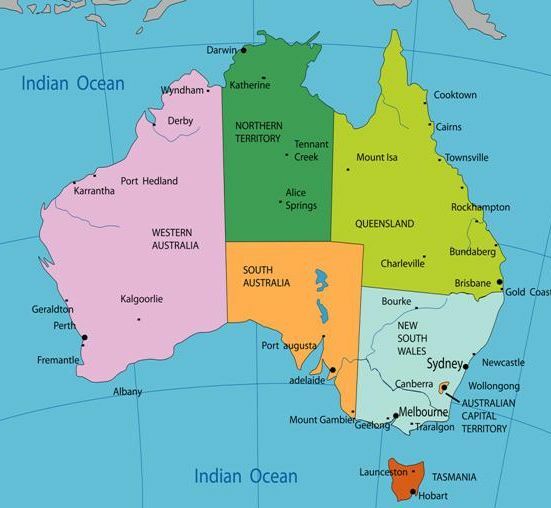 18 of these islands are within 39kilometres of the Australian mainland, making up Australia's most northerly region. Two of the more populated Islands are Horn and Thursday Island, both within 30km off the tip of Cape York. Tens of thousands of migratory sea-birds spend the winter on the beaches and islands off the cape (1-5). Off the coastline in this area is the Great Barrier Reef, the world's largest World Heritage property extending over 2,000 kilometres and covering 348,000 km2 (6). The Great Barrier Reef starts from the tip of Queensland and extends down the Queensland Coast right through to Lady Elliot Island, North-east of Bundaberg (7). The Reef “is of international importance to seabirds, providing breeding and roosting habitat, feeding grounds and migratory pathways to at least 23 seabird species and 32 shorebird species. It is estimated that between 1.3 and 1.7 million birds breed on the Reef’s islands and cays, comprising over 25 percent of Australia’s breeding seabird populations, and approximately 50 percent of the global population for some species. Most land birds, shorebirds and seabirds using or overflying the Great Barrier Reef World Heritage Area (World Heritage Area) are protected under various pieces of legislation…” (8:Pg 10). From the tip of the Cape York Peninsula down to Princess Charlotte Bay, the base of the Peninsula, is around 600 kilometres (km’s) and is compromised of various National Parks. Islands such as Flinders and King sit within the Bay (9-11). Jumping from Princess Charlotte Bay to Cairns (around 350kms); Upolu and Michaelmas Cay’s, both important seabird sites, (12-13), sit forty km’s north-east of Cairns. Michaelmas Cay is “one of the most important seabird nesting sites of the Northern Great Barrier Reef and the southern limit of sooty tern breeding on the reef” (8). The Franklin Islands (High, Normanby, Mabel, Round and Russell), are around ten kilometres offshore from the mouth of the Russell and Mulgrave rivers at Russell Heads (approx 50km’s south of Cairns). “The islands support a large array of bird life including numerous seabirds” (14). Another 150km’s down the coast is Mission Beach, where less than 5 km’s offshore are a group of islands known as the Family Islands. This group includes islands such as: Dunk, Bedarra, Woln Garin and Mound (Purtaboi). The last two islands being protected sea bird nesting habitats. A little further down, off the coast between Ingham and Tully, “lies 15 continental islands, ranging from the 39,300ha HinchinbrookIsland to tiny Tween Island. Hinchinbrook is Australia’s largest island National Park and is situated approximately 8kilometres off the coast, with surrounding islands such Brooke Islands and Eva Island being restricted to human access from October to March due to bird breeding (15-18). Arriving at Townsville, Magnetic Islandis seen from the shoreline and is less than five km’s off the coast. Over 180 species of birds have been recorded on Magnetic Island, including numerous species of sea and shorebirds (19-20). 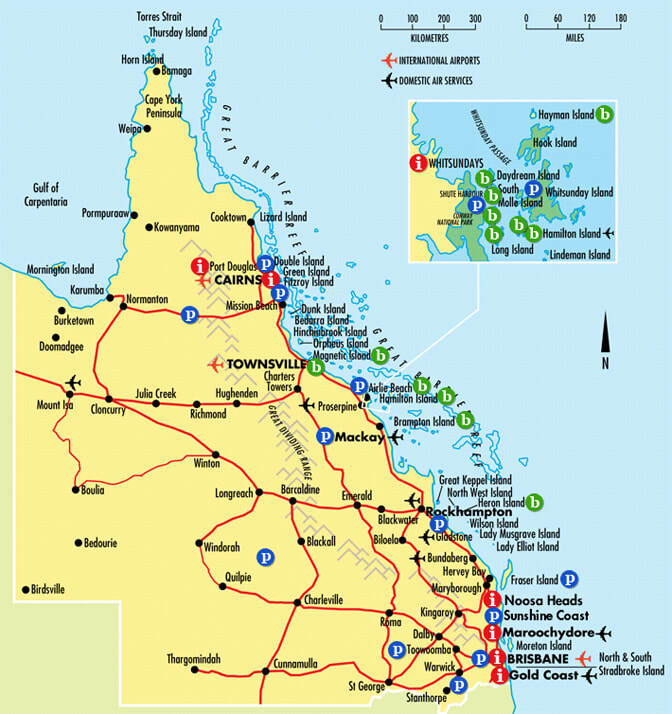 The area from Bowen to Mackay is the on-shore coastal districts associated with the central region of the Great Barrier Reef, home to the WhitsundayIsland group. Airlie Beach (In between Bowen and Mackay) is generally known as the “gateway” to the Whitsunday Islands, with the majority of the islands being accessed (especially by tourists) via this harbour. The Whitsunday Islands comprise of around 150 islands that can be divided into four groups; The Whitsunday Group, the Lindeman Group, The Molle’s and the Northern Group and range from within a couple of kilometres from the coastline to around 40kms offshore (21-27). These islands host a variety of bird life and many host marine birds (28), with seasonal closure to safeguard seabird breeding being common on a number of them (29-30). Eshelby Island (Northern Group) is five to ten km’s from the Cape Gloucester / Dingo Beach shoreline (31) (approximately 30 kilometres north of Airlie Beach) and “probably has the most prolific bird life of any island in the Whitsundays” (32). It is permanently closed to the public to protect the environment of the thousands of seabirds that nest there (29). Most of the islands in the Whitsundays have National Park status and there is also a 35,000 sq. km marine park that stretches from CapeUpstart (between Ayr- Bowen) in the North to Sarina in the south (33). There are around 40 beaches in the Mackay-Sarina area and numerous offshore islands/reefs, ranging anywhere from one to fifty kilometres off the coast (34-35 ). “In the Mackay and Whitsunday area, recreational boat registrations (an indicator of how many residents access offshore islands) numbered 14,077 in 2004, growing annually by between 10 and 20 percent” (36:pg 7). On the mainland, Sarina Inlet (Ince Bay Aggregation: 40 km south southeast of Mackay) to Cape Palmerston is one of the many listed “important wetlands” in the area, hosting numerous bird species, including shorebirds such as sandpipers, godwits and curlews, and seabirds such as gulls, terns and cormorants (37-38). Travelling from Sarina to Yeppoon is a trip of around 300kms, with the National Parks of Cape Palmerston, West Hill, Mt O’Connell and Byfield on the shores (39-41), with numerous islands and reefs (eg: Rosewood, Long Island Townshend, Gull Cay, Woods, Leicester) along the coastline (34). The towns of Yeppoon, Emu Park and Keppel sands are on the shoreline of Keppel Bay, with the two largest Islands, Great Keppel and North Keppel being surrounded by 16 smaller islands. North Keppel and surrounding islands (eg: Pumpkin, Corroboree, Sloping, Conical Rocks) are around ten km’s off the coast of Yeppoon, with the more well known Great Keppel Island sitting approximately 15km’s offshore a little further south of this group (42-44). Pelican Island, four km’s offshore from Emu Park is the closest island with breeding seabird populations in this area (45-47). Slightly further down from this region is The Curtis Coast Region where; Curtis Island hugs the coastline (48), Facing Island is a few km’s out to sea and Boyne Islandis accessible via a bridge at Tannum Sands, south of Gladstone (49-52). The Capricorn and Bunker groups, lie between 45-75km’s offshore from the coastal areas of Gladstone and Town of 1770 (120km’s north of Bundaberg) and consist of numerous islands and coral cays that form the southern end of the Great Barrier Reef (53-55). “The Capricornia Cays also contain 73 to 75 percent of the seabird biomass of the Great Barrier Reef” (56: pg 434). Islands/cays include popular destinations such as Herron and Lady Musgrave Islands (57-59), where visitors/campers are advised to “wear insect repellent to deter bird ticks” (54), as well as those such as One Tree and Wreck Island (60-61) where “the zoning calls for total closure of the island to protect a turtle colony and breeding seabirds, including Wedge-tailed Shearwaters, Roseate Terns and Black-naped Terns” (29: pg 73). The Great Sandy Marine Parkextends from Baffle Creek (Between Gladstone and Bundaberg) in the north to Double Island Point (south of Rainbow beach) in the south (62-67). “It includes Hervey Bay, Great Sandy Strait, Tin Can Bay Inlet and the waters off the east coast of Fraser Island, seaward to three nautical miles” (62). The coastal wetland of the Great Sandy Strait, (including Tin Can Inlet and Tin Can Bay) are listed as internationally important bird sites (68-72). “These sites are important for migratory birds as roosting and feeding grounds where they can both recover and prepare for the long flights between locations. The Great Sandy Strait site is recognized as being an important location for 18 species of internationally listed migratory birds” (68). Fraser Island is a National Park; Great Sandy National Park, reflecting the fact that it is the world’s largest sand island (The island is 123 km long and covers an area of 166,038 ha). It is around five to ten km’s off the coast of Hervey Bay and Maryborough (73-75). Fraser Islandhas numerous bird species, including land birds, shore birds and seabirds such as cormorants, terns, shearwaters and gulls (76-77). Just south of this region is the Moreton Bay area (an important habitat in the East Asian–Australasian Flyway), which extends from Caloundra to Surfers Paradise on the mainland and consists of over 360 islands including popular holiday destinations such as, Bribie, Moreton and Stradbroke (North and South) Islands (78-80). Bribie Islandis offshore from Caboolture and is accessible via a connecting bridge as it is only separated from the mainland by the small water passageway, Pumicestone Passage (81-82). Eighty percent of BribieIsland is a protected flora and fauna Reserve and Pumicestone Passage is a Marine Reserve (83-84). These areas support hundreds of different species of birds, including numerous land birds, shorebirds and seabirds such as cormorants, terns and gulls (85-86). Moreton Island is a National Park area in Brisbane city Shire (87). It is 15kms from the mainland (40kms north-east of Brisbane) and is home to many different animals, including birds (75,88). “Over 180 species of birds, including seabirds, waders, forest birds and birds of prey, can be seen” (87) on MoretonIsland. North Stradbroke Island is in the Redland shire (89), which extends from Thorneside and Wellington Point in the north to Redland Bay in the south on the mainland and the offshore areas of “North Stradbroke Island, Peel Island, Coochiemudlo Island and the Southern Moreton Bay Island group of Russell, Macleay, Lamb, Karragarra and Perulpa” (90:pg 7). Of these, Coochiemudlo Island is the closest to mainland (one kilometre offshore), with North Stradbroke being the most distant island at five to fifteen kilometres (depending on which part of the Island) offshore (91-92). There are many “important bird” and National Park areas in Redland Shire (90), with one of these being NorthStradbroke Island. At Point Lookout on North Stradbroke, wedge-tailed shearwaters have a breeding colony, whilst many other seabirds such as gannets, albatrosses, petrels, frigatebirds, boobies, skuas and terns have been recorded off the point (93). Whilst South and North Stradbroke are in close proximity (Pre 1896 they were one island, now separated by Jumpinpin Bar), South Stradbroke is situated in the shire adjacent to Redlands, the Gold Coast shire (94). It is only 200 metres from the northern end of the Spit (edge of coastline) and an important site for a number of animals including turtles and seabirds (95-96) : “Each year the northern tip of South Stradbroke Island, known as The Pin to the boating community, hosts one of the most important gatherings of shorebirds and seabirds in Australia. The site, surrounding Horseshoe Bay, supports internationally migrant wading shorebirds, including Eastern Curlews and Bar-tailed Godwits, which are protected under international treaties. It is also the city’s only breeding site for at least four important [sea] bird species, such as the Little Tern” (97).